Setcom Corporation brings you the next generation of headsets for fire apparatus intercom systems. Beyond its state-of-the-art features, our wireless headset is the most functional and durable wireless headset available. "Instant On" - No need to turn the headset on and off. Advanced motion sensor technology has been integrated into the Liberator Headset. Headset shuts down after 15 minutes of inactivity and will automatically turn back on when the firefighter grabs the headset. Cell Phone Integration - Most Bluetooth®-enabled cell phones and other audio devices can be used directly with the Liberator Headset. Aerial Advantage™ Antenna - Setcom offers the only wireless system on the market with the option to have an advanced antenna designed to optimize the wireless connection between the cab of the apparatus and an aerial platform or ladder. The Aerial Advantage™ Antenna is engineered to increase the wireless range on the vertical axis versus the lateral orientation of standard wireless systems designed for emergency vehicle use. Up to 30 hours of continuous talk time allows for more uses with fewer charges. Encrypted wireless link for maximum security. Elimination of some cables reduces intercom installation time and cost. Premium dual-speaker headset with noise reduction rating of 23dB. Heavy-duty and durable design to extend life in a demanding environment. Will operate while plugged into vehicle's power. Backward compatible with existing wired Setcom 950 and 1300 systems. Installs within minutes on Setcom 950 and 1300 ARFF systems. Only wireless headset to have direct to cell phone integration. Longest battery life. 25% longer life for extra safety. 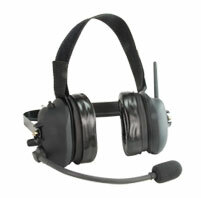 Only wireless headset to have "Instant On" technology which saves time on the way to the scene. Only wireless headset to integrate a portable radio allowing for multiple channel monitoring. Only wireless system with the flexibility of the Aerial Advantage Antenna. Setcom uses Bluetooth technology, as opposed to DECT6, for voice transmission. DECT (Digitally Enhanced Cordless Telecommunications) is a European standard designed for non-critical, cordless phone systems for residential, in-home use. Bluetooth operates over 2.4GHz which is a proven frequency band free from the interference of powerful cell phone transmission technology. DECT6 operates at 1.9GHz, which is sandwiched between the high powered transmit and receive 1.9GHz frequency bands that most major cellular carriers use in the United States. See frequency chart. Thus the 1.9GHz frequency band has the potential to have significant interference. Liberator system lets you put antennas where you want them in the fire apparatus. Some DECT implementations require that the antennas be attached to the window of the apparatus thus decreasing visibility for drivers and passengers. Setcom's Bluetooth implementation gives users much more flexibility in the positioning of the antennas in the vehicle.